A robust annual herb up to 2m high, that is bushy, glabrous (without hairs or scales) or sparsely hairy with non-glandular hairs. Warm-temperate and subtropical regions, mainly in open, warm locations, particularly where the soil has been disturbed. It can tolerate arid conditions. It is a poisonous weed, that is often found on river flats and near stockyards. It has hairless or sparsely hairy stems that are spreading and leafy. The leaves are generally light dull green, 8-35cm long and 5-20cm wide. The mature leaves are wide angularly ovate to rhombic with margins that are deeply lobed with the lobe margins coarsely toothed or sinuate (with a deeply wavy margin). The capsule is ovoid and is 2-4.5cm long. The flowers are white to lavender with the calyx (the sepals of one flower collectively) usually being 3-4cm long with the lobes being 6-8mm long. The corolla (the petals of a flower collectively) is mostly 6-8cm long and has five petals that end in a slender point that is 1-2mm long. The stamens are not exserted (not projecting beyond the sepals and petals). The fruit is a capsule that is ovoid and is 2-4.5cm long and 1.5-3.5cm in diameter. The capsule is erect on a straight stalk with numerous (>100), slender spines that are of a variable length the longest being less than half the length of the capsule. The seeds are black or grey, pitted, 2.5-4.5mm long. Flowers from summer-autumn. This weed competes strongly with summer crops in many areas of the world. It was introduced into Australia in the 1800's. It is the most common of the thornapples in Australia. It has flowers that are 6-10cm long with a capsule with >100 slender spines of various lengths that are evenly distributed. Datura stramonium has white flowers 4.5-6cm long with the capsule having 40-60 stout spines with the spines towards the base usually being shorter. 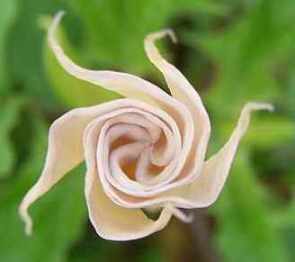 Datura stramonium and Datura ferox have capsules erect on a straight stalk with the seeds being black or grey. Datura leichhardtii, Datura metel, Datura inoxia and Datura wrightii can be differentiated from these two species as their capsules are held on a curved stalk, with the seeds being brown or yellow. All parts of the plant are toxic to livestock and humans. It is malodorous (evil-smelling) and has a bitter taste. Usually this deters consumption by livestock. A purple flowered form of Datura stramonium is Datura tatula.